A frothy, effervescent gift. 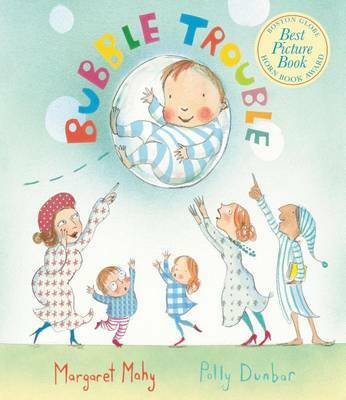 - Kirkus Reviews, starred review Little Mabel blew a bubble and it caused a lot of trouble- / Such a lot of bubble trouble in a bibble-bobble way./ For it broke away from Mabel as it bobbed across the table, / Where it bobbled over Baby, and it wafted him away. Ebullient rhymes, joyful illustrations, and a village full of delightful characters, now in a paperback edition. Winner of the 2009 Boston Globe-Horn Book Award for Best Picture Book! Internationally acclaimed children's author Margaret Mahy received many honors during her lifetime (1936-2012), including the Hans Christian Andersen Award, a Carnegie Medal, and citations from the American Library Association. She was from New Zealand. Polly Dunbar lives in Brighton, England. She also illustrated Margaret Mahy's The Man from the Land of Fandago.